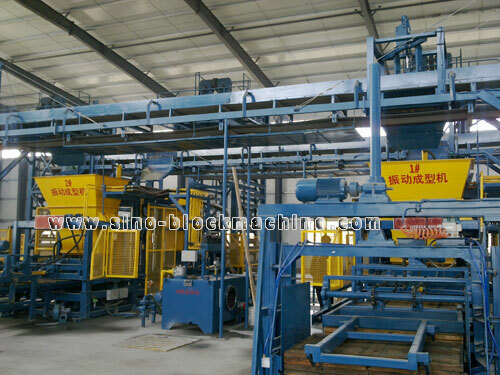 SINOSUN QT12-15 concrete block making machine has been called "quite explicit Germany customer new style, the largest and most modern concrete block making machine in China". The design of this concrete block machine is unique, hydraulic engine system adopt international famous brand hydraulic elements. 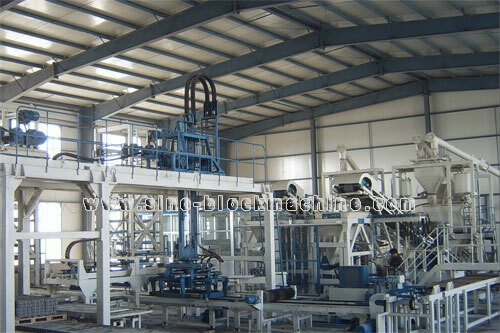 The directional control valves of the block making machine is very fast and smooth in the operation. The hydraulic system has plenty flow of hydraulic oil and pressure, its design flow for 290 liters/minute and pressure for 21Mpa. 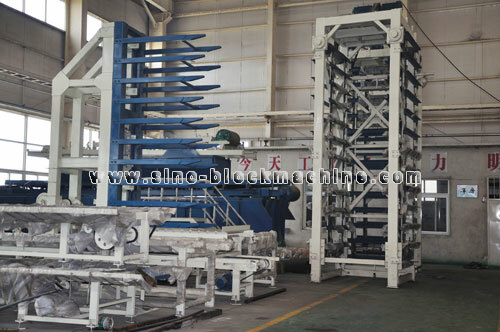 QT12-15 concrete block making machine is the heart of fully automatic block production line, is currently on the market selling high-end products. 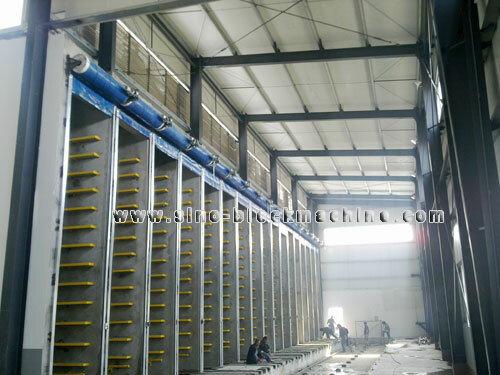 Its structure consists of base material distributing mechanism, color-face material distributing mechanism, molding mechanism, remolding mechanism, pallet feeder and green blocks belt conveyor. 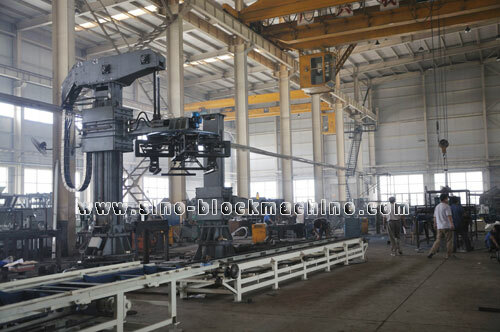 In addition, there are hydraulic, pneumatic and electric control systems that constitute the entire block machine. It can not only produces standard or non-standard load-bearing wall blocks, but also produces various colorful floor interlocking blocks and lawn blocks. QT12-15 block machine is a integrated equipment that combines mechanic, hydraulic and automatic computer control. It features high efficiency, reasonable design, compact structure, easy operation, convenient maintenance. Hydraulic pressing as main forming type, mechanical vibration as auxiliary forming type, vibration and pressing together forms high strength blocks, can be more than 15Mpa. And the blocks has high density, better antifreeze, anti permeate, sound-proof and thermal insulation performance, accurate size. 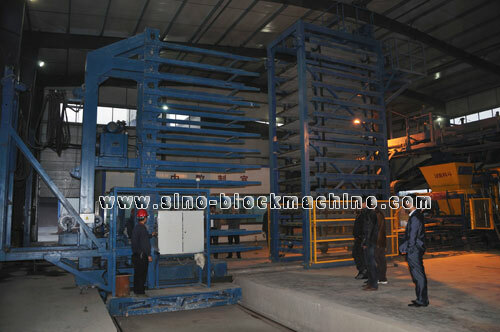 The vibration system is the heart of concrete block machine. This system has two 3kw vibration motors in up mould and two 15kw vibration motors under down mould. From 0-65 Hz only 1-2 seconds response time, the vibration table produce vertical amplitude for 1-2 mm, also could produce 33 tons giant vibration force rapidly. The excitation force it produced is 15-20g (g = 9.81 meters seconds), more than Europe similar type which is generally 15g, making the materials become blocks in 5 seconds. In ordinary material proportion, block strength is more than 15Mpa. In order to protect block machine from vibration damage, our company adopts advanced damping technology, putting high quality rubber blocks on vibration part to absorb vibration.